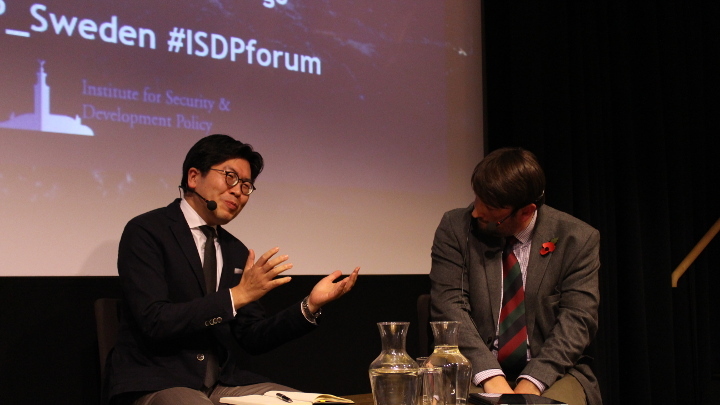 On November 13, 2018, ISDP welcomed Associate Professor Michito Tsuruoka from the Faculty of Policy Management at Keio University and Dr John Hemmings, Director of the Asia Studies Centre at the Henry Jackson Society and an Adjunct Fellow at the Centre for Strategic and International Studies, for a forum discussion entitled “Meeting Shared Challenges – Securing the Liberal International Order”. The event was held at the Museum for Mediterranean and Near Eastern Antiquities and was moderated by Dr. Lars Vargö, Distinguished Fellow at ISDP. Associate Prof. Michito Tsuruoka began by articulating Japan’s optimistic commitment to upholding the liberal international order. He introduced five pillars of the Japanese foreign policy towards increasing the benefits of the rules-based system: 1) security alliance with the United States as a cornerstone of regional security; 2) the EU-Japan Economic Partnership Agreement (EPA) and the Strategic Partnership Agreement (SPA) frameworks; 3) the historic signing of the Comprehensive and Progressive Agreement for Trans-Pacific Partnership (CPTPP or TPP-11), advancing the course of free trade and international cooperation, as opposed to revisionism; 4) expansion of the strategic partnership networks in Australia, India, France, and the United Kingdom, specifically in areas of security and defense; 5) championing an increased economic, security, and defense engagement in the Indo-Pacific. Prof. Tsuruoka concluded his presentation by analyzing the phenomenon of global co-existence with Russia and China, which calls for a better understanding where and in what context the international community must be ready to draw the limits of a disruptive behavior. Dr John Hemmings continued by distinguishing the rules-based and the normative aspects of the international liberal system. As a transatlantic power, he stated, UK intends to increase its maritime involvement in the Indo-Pacific and Southeast Asia; in additionally holds a strategic interest in the TPP-11 framework. Yet Dr Hemmings’ outlook on the international liberal order might be a little less optimistic. The authoritarian powers are rapidly expanding their global investments in the critical and digital infrastructure; China develops a neo-authoritarian social credit system; Russia’s influence in the UK is on the rise, with the number of Russian spies higher than in 1985. Amid the challenges presented to liberalism by the US “reaganist” foreign agenda, the Russian and Chinese traditional reluctance to the global normative system, e.g., democracy and human rights, the United Kingdom, too, finds itself at a crossroads: will it continue to uphold the principles of the global liberal order? The presentations were followed by a discussion, moderated by Dr. Lars Vargö: what constitutes the immediate threats to the international liberal order from Japan’s and the UK’s perspectives and what has already gone wrong? The forum concluded with a Q&A session from the audience, covering the topics of China’s global ascendance and Russian security threat; the national interest and contestedness in the international liberal order; Japan’s instrumental role in global cooperation; the importance of the strong collective messaging in enforcing the rules-based order; non-traditional threats arising from non-state actors and populist movements. Find the video of the event here or below.